Tap into the amount of expertise you need by selecting the annual support package that fits your business. 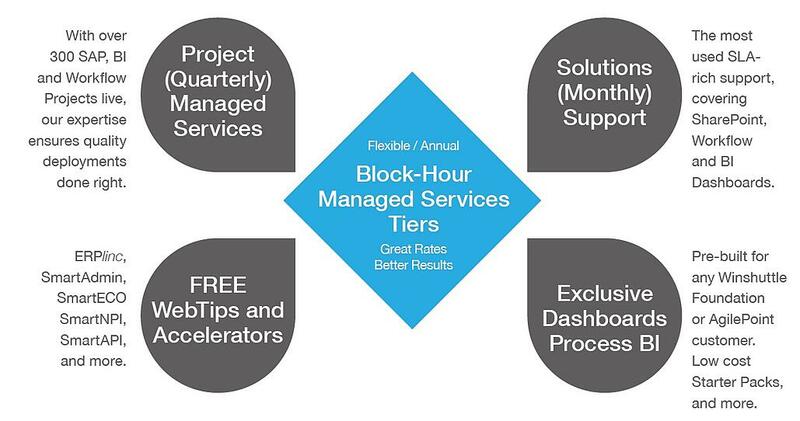 Each tier includes a full suite of services that can be used on a block-hour basis, allowing you to sync hours of expertise with areas of greatest need, from gaining more accurate Dashboard information to complete system transformation. The result? Cutting edge solutions that will help you make better decisions faster, with confidence that your data and processes are being orchestrated at the highest level of expertise. Automation and future-proofing is accelerating at an exponential pace, making it difficult to internally staff with the expertise required. Even an exceptionally talented staff can be limited by a bandwidth. The deeply experienced team at Clear Process Solutions is uniquely able to support your ongoing operations, and can also drive innovation that delivers rapid value via complete digital transformation. BPMS incorporates 2 monthly services from CPS: CPS SolutionCARE services and CPS Professional Services. With BPMS, the client receives a higher level of management oversight, dramatically reduced hourly rates and a wider inclusion of available business process outsourcing. CPS SolutionCARE addresses reactive type service requests (incidents) and some development, training and architectural work items. It is intended to cover task-oriented, short-duration services and not intended to substitute for formal Professional Services engagement. CPS Professional services are a committed number of hours to be used for Professional Services/Statement of Work (SOW). Each engagement will have its own SOW/Estimate and will require client approval before work will commence. Robotic Process Automation projects for SAP.